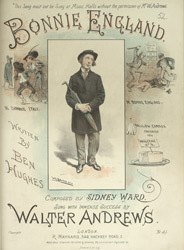 The copyright of Music Hall songs belonged to the performers, they could only be sung in public by other professions, with the permission of the original artist. They could however be performed in private by anyone. The development of the upright piano meant that many Victorians could afford one for their homes, and with the printing of affordable sheet music, singing and playing instruments became a popular leisure activity for the middle classes. This song parodies 'England', it laughs at the fact that although it is safe to walk the streets you are in fear of candles being melted into your food to fill out the dish.